I cannot remember when I last visited Kildare, and even then my trip today has been rather superficial – to shop at Kildare Village. Granted, it wasn’t my idea to start but at the offer of someone driving us there, I thought, why not check it out after all the fuss I’ve heard from many? The Village is actually rather quaint, well laid out, and good value purchases to be had. 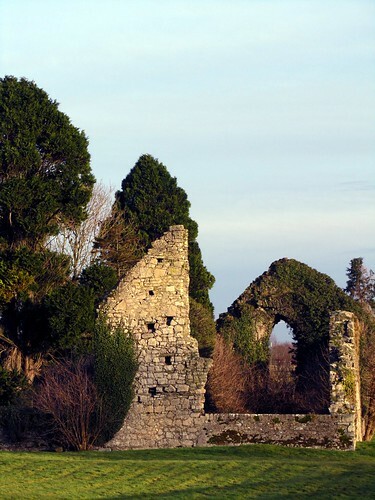 Adjacent to the Village is the ruins of Grey Abbey, a Franciscan site dated from 13th century. Its name derived from the colour of the robes wore by its monks and the ruins forming what was the Abbey Church, it looks very inviting for further exploration, if only I wasn’t pressed for time. Visitors’ tips: if you take a train + complimentary shuttle bus to Kildare Village, present the train ticket at the Village Tourist Information Centre for a VIP card that gives you a further 10% discount on all purchases. Yes, even on top of discounted prices. Look familiar … I’ve been there? Errm, I don’t think so. There are plenty of ruins in the country.